Prestonia portobellensis is a beautiful member of the Dogbane family, Apocynaceae. The genus Prestonia comprises approximately 60 species found in Central and South America and the West Indies. This widespread liana is characterized by oval leaves with a narrow tip, 9-20 cm long, arranged oppositely. Flowers are distinctive with 5 corolla lobes, 10-15 mm long, on a raised greenish tube with a yellow rim. Lobes are white with pink striations. Fruits are a dry follicle containing seeds. Like all members of the family, this liana contains a thick milky latex. It flowers most of the year, but flowers are more abundant in the dry season and early wet season. Fruits mature primarily in the dry season. 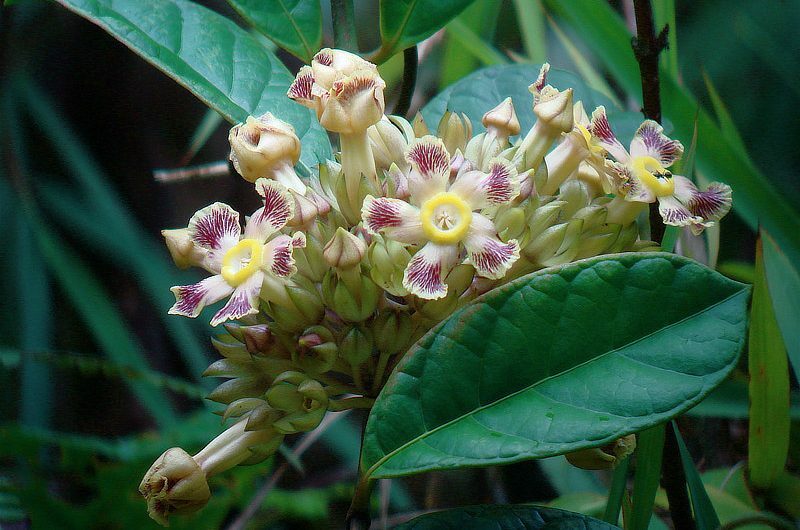 Prestonia portobellensis is found from southern Mexico to Ecuador, and is common along forest edges and in a wide variety of habitats in Panama.